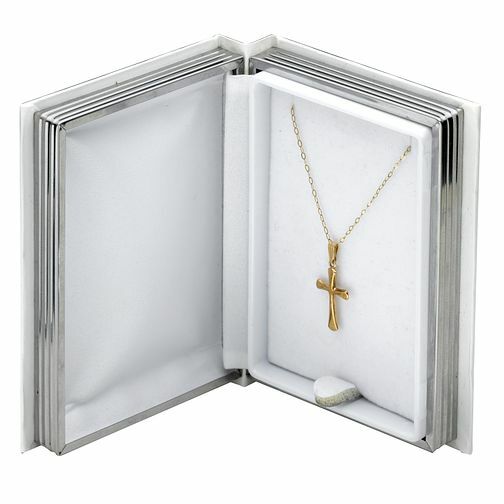 A cross is a traditional gift to mark special occassions such as a christening or confirmation, and this gold cross comes presented in a box designed to look like The Bible. 9ct Gold Cross and Bible Box is rated 3.8 out of 5 by 8. Rated 1 out of 5 by Anonymous from Not what was expected Bought for my daughters christening as I actually had this myself a few years back and knew how lovely it was. When it came the box was not as shown it was cardboard and tacky. The chain didn’t appear the same as the photo and also the bit attaching the cross to the chain was tacky and not as shown in the picture. Not worth £79.99. Will be returning. Almost like a cheaper made version of the one I had myself but still using the old image of the product.